« The Beast from the East! 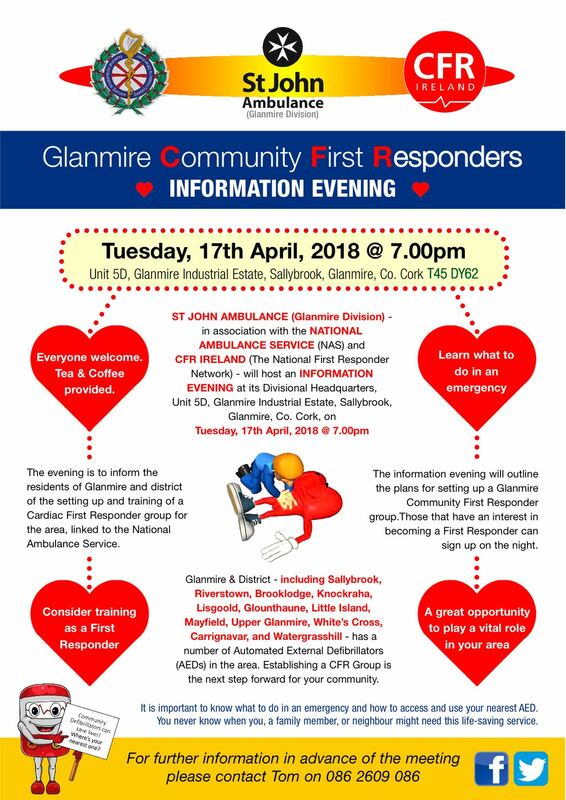 St John Ambulance Glanmire, in association with the National Ambulance Service (NAS) and CFR Ireland, will host an information evening at its Divisional Headquarters Unit 5D, Glanmire Industrial Estate, Sallybrook, Glanmire T45 DY62 on Tuesday 17th April at 7pm. 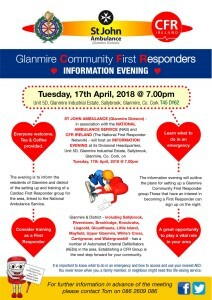 The information session is intended to inform members of the local community about the establishment of a Community First Responder group in Glanmire, linked to the National Ambulance Service. Community First Responders (CFR) are volunteers who are trained to attend certain types of emergency calls in the area where they live or work. Their aim is to reach a potential life threatening emergency in the first vital minutes before the ambulance crew arrives. Their role is to help stabilise the patient and provide the appropriate care including defibrillation, until the more highly skilled ambulance crew arrives on scene to take over the treatment. CFR groups who are linked to the NAS National Emergency Operations Centre are alerted to an emergency in their area and as they are community based, can provide medical assistance within minutes of a 999/112 call being received. 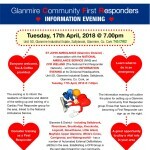 Speakers on the night will include Norma O’Donnell (Advanced Paramedic) Community Engagement Officer with National Ambulance Service, Gerard Doyle (Paramedic) Superintendent of St John Ambulance Glanmire, and a representative from CFR Ireland, the umbrella group for CFR schemes across the country. The information session is open to all interested parties living locally in Glanmire, Sallybrook, Riverstown, Brooklodge, Knockraha, Little Island, Mayfield, Upper Glanmire, White’s Cross and surrounds. Contact glanmire@stjohn.ie or Tom on 086-2609086 for more information. Find us on Twitter @GlanmireCFR or Facebook GlanmireCFR.